New Year's Eve is finally here and my heart is racing! My Big Year for New York State starts at midnight tonight, and I'm thrilled to finally start. Tomorrow at sunrise I'll be at Oak Beach to try and see the Townsend's Solitaire, to Massapequa for Eurasion Wigeon, and possibly White Fronted Goose. Of course, there's always a chance in the area for Little Gull, Black-Headed Gull, Bohemian Waxwing (!) and more, so who knows how it will actually go. Then it's back to Park Slope by 1pm to do my co-op shift (I'm a member of the Park Slope Food Co-op) and then out again at 3:45 to try and get the Chat at the Brooklyn Botanic Gardens. After dark I'll planning on heading out to Montauk, where I'll spend the 2nd and 3rd looking looking for a couple of rare birds that have been around lately (Pink Footed Goose and Barnacle Goose), as well as the sea ducks off of Montauk Point, and anything else. I'll also try for the Barrow's Goldeneye in the the Oyster Bay section of the North Shore on my way back. I'll be posting photos as I go, so stay tuned, and Happy New Year Everyone! 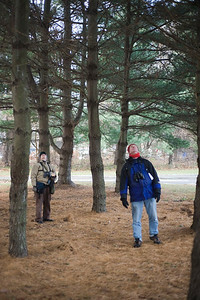 On Saturday December 8th, Paul Keim led a Brooklyn Bird Club trip to Croton Point Park, in Croton-on-the-Hudson, New York, to search for owls. The park is a former landfill, and now is home to four species of owl. Seeing even one species, however, is often difficult at best. Owls are nocturnal, and during the day they typically roost in evergreens or tree hollows, and can be extremely difficult to spot. They don't offer the typical clues that help me to spot birds: movement and color. Instead, they sit perfectly still, deep in a tree, with perfectly camoflauged plumage. So how do you find them? You go with Paul! Paul has a passion for owls and has studied them for most of his life. In addition, he's spent a lot of time at Croton, and has a pretty good idea of where to look. 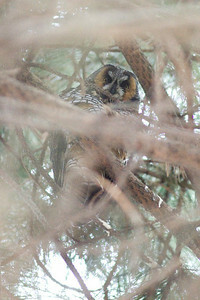 In fact, it only took him about 10 minutes to lead us to a pine grove where we saw this amazing long-eared owl, roosting with two others. Owls frequently leave subtle signs around their roost sites. "Whitewash" is owl crap, and is often seen in and around a roosting tree. Unlike tree sap, whitewash is bright, bluish-white, and has a thick, almost marshmallowy consistency. It might be splattered on the leaf litter below a tree, or sticking to branches. 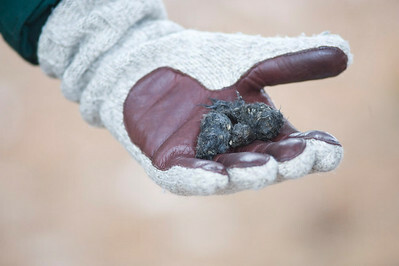 Another byproduct of the owl's diet are pellets, which are the parts of their prey that they were unable to digest. Pellets are oblong balls of bone and hair, and under roosting trees you might find several. Paul did exactly that beneath the long-eared roosting spot...first he pointed out whitewash, and soon he had three pellets with tiny bones and even a skull lodged inside. We were careful to keep our voices down and not be too intrusive with these owls. They are sensitive to human contact, and if you hassle them they may leave a spot for good. That's why birders rarely reveal a known owl to anyone but other birders who they know will be sensitive. Photographers tend to be the worst culprits...I was recently told of some photographers at Jones Beach who had actually cut away part of a pine tree to get better shots of an owl. As a photographer and birder I find that kind of activity despicable. If you ever see anyone doing anything like that in a park, get a park ranger or the police. Moving on from the long eareds, we went deeper into the woods. Paul noticed another "owly" sign...bird activity. The birds in the area seemed a little nervous...lots of little chips and chirps that seem to say "stay alert". Sure enough, Paul found the source of their consternation. 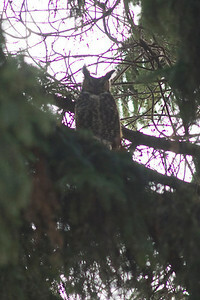 A large, gorgeous Great Horned Owl perched in the open in a large evergreen. We had incredible views of this bird, who sat and watched us for a number of minutes. There's no question that if we were a little smaller it would be mealtime for the owl--there is that unflinching raptor's stare that locks you in place. At the same time (and probably because I'm not smaller than they are), the bird seems soft and beautiful. That moment, when I was looking at the bird and held in the bird's gaze is immutably fixed in my mind. My name is Scott Whittle and I'm a professional photographer (www.scottwhittle.com). I have an MFA in Photography from the School of Visual Arts in New York City. I started birding as a teenager, and then dropped it for many years. I started to bird again in 2007, and have been birding since then in Brooklyn, NY and Cape May, NJ.